Baby Bandana Drool Bibs for Drooling and Teething Boys and Girls. 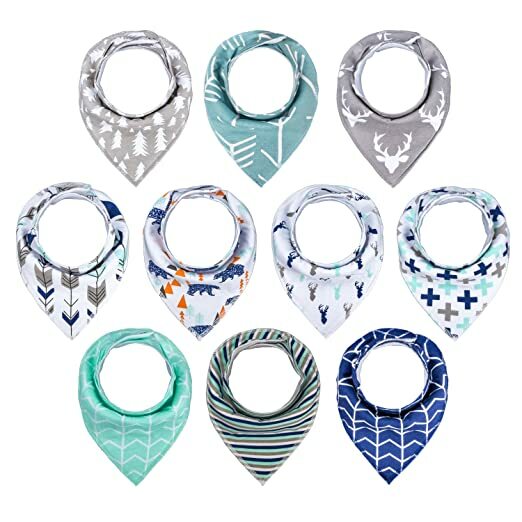 Pack of 10 Baby Bibs: MiiYoung Bandana Bibs come in a set of 10 pieces. We’ve made sure you’ll never run out of styling options! Our bibs look great on both little boys and girls, so if you are the proud parent of either, or a set of twins, then stock up NOW! Soft, Non-Scratchy & Absorbent Material: our bandana bibs are made with 100% Organic Cotton (in front) and 100% Polyester Fleece (in back) keeping your baby’s soft skin dry and protected at all times. Two Adjustable Hypoallergenic Nickel-Free Snaps: MiiYoung bibs can fit many different sizes of children because they have two hypoallergenic nickel-free snaps that fit a range of ages from 3 months up to 2 years old. In addition, the Snap On/Off feature avoids scratching your baby’s skin when opening and closing it as Velcro bibs do. Say Goodbye to Baby’s Drool Rash! Perfect Baby Shower Gift Set: with cute unisex prints and colors, these bandana bibs are ideal as a gift for a new mom, she’ll appreciate this adorable gift set. Give with love and confidence!